Be responsible for creating 3D surface or solid models of via reverse engineering, and subsequent mold design and extrusion dies; programming CNC machining centers 3-5 axis and wire EDM equipment to facilitate mold construction. •Study sample products or drawings to determine design approach, tolerances, sequence of operations, material and programming requirements. •Select or design holding fixture, cutting tools, attachments, and materials. 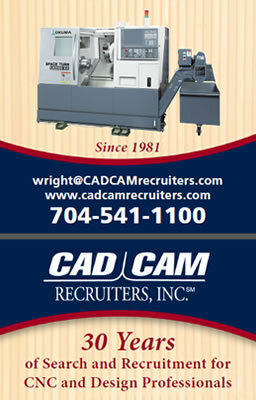 resume bw@cadcamrecruiters.com PLEASE include details about yourself .